Is there a way to add a Pantone swatch from the Pantone palette into the document swatches and for it to retain it's name, rather than changing to 'Global Colour x'? Specifically relevant for spot colours from the Pantone Solid Coated & Uncoated books. Do I have to manually rename the colour back to it's pantone name each time? Also, if I want to change the global colour to another Pantone colour , the edit colour palette won't let me search for another colour by name or show a list. I have to guess from the swatches which is my new colour. Is this a bug or am I missing something? Thanks Callum. At least I can stop wondering that I am doing it wrong. But ... 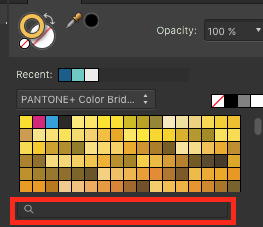 I think you missed my point about there being no search field if you want to change/edit an existing swatch (see original image I attached). The search field exists if you are picking a swatch for the first time. But if you want to change the swatch to another pantone colour, you can only see the swatches in block form; no list view or search field. This makes it difficult and cumbersome to replace a colour, document wide. (eg when the client changes their mind about a spot colour in your artwork).